This post is part of a series on German wheat beers. The clove and banana balance in a hefe-weizen is influenced by the pitching rate and fermentation temperatures. As I mentioned in the post that began this series, in many ways brewing a German hefe-weizen is similar to brewing any other ale. And conducting the boil is one part of the brewday where this is mostly true. As with the vast majority of beers, you want a vigorous boil to sanitize the wort, coagulate the break material and isomerize the alpha acids from the hops. (There are also a host a minor goals that the boil accomplishes.) There is one minor twist when boiling a hefe-weizen wort. 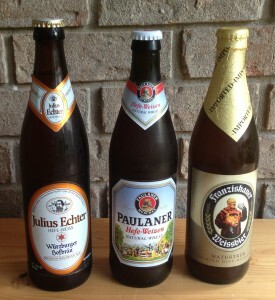 Two differences between a wheat beer wort and a “regular” ale wort are that a hefeweizen wort contains more protein and fewer tannins. Wheat malt has a higher protein content and the low hopping rate (typically 20 IBUs or less) contributes fewer hop-derived tannins to the wort. Because protein-tannin complexes are part of what you want to precipitate in the boil, you should boil your wort vigorously — at home for at least 90 minutes (and perhaps up to 120 minutes). Commercial brewers, if they employ an external calandria, can cut the time to 70 or 80 minutes. Other than extending the boil longer than some ales, the hefe-weizen boil can be handled as you normally would. A hefe-weizen fermentation should yield a beer that exhibits the typical hefe-weizen aroma. This aroma is complex, but dominated by a spicy, phenolic note and a banana-like aroma. The clove-like phenolic character is conferred by the molecule 4-vinyl guaiacol (4VG) and the banana aroma by iso-amyl acetate, an ester that can appear in “regular” ales fermented at higher temperatures. The most important variable in getting the appropriate hefe-weizen aroma is choosing the right yeast strain, and I’ll cover that separately in an upcoming post. However, how you conduct the fermentation also effects the expression of these characters. Iso-amyl acetate (the “banana ester”) production is increased by all the factors that increase esters in general in beer fermentations. Higher gravity worts, lower pitching rates, lower aeration rates and higher fermentation temperatures all promote ester production. The factors that stimulate 4VG are largely the same as it is a yeast by-product just as iso-amyl acetate is — higher gravity worts, lower pitching rates, lower aeration rates and higher fermentation temperatures. In addition, open fermentations have been found to stimulate both ester production and 4VG production in hefe-weizens fermented with a hefe-weizen specific yeast strain. Open fermentation also allows the brewer to “skim the scum” and top-crop the yeast, both of which are traditional practices. (Many commercial breweries have switched to cylindro-conical fermenters, however.) At home, fermenting in a bucket and opening it during the most active part of fermentation can be done. The bucket is not a shallow fermenter, as a traditional open fermenter would be. And you should really only open the bucket in a room that was clean and when the wort is (at least partially) protected by kräusen. However, this is worth a try for homebrewers who want their hefe-weizens to be brewed as authentically as possible. Other than those factors, the things that drive 4VG and iso-amyl acetate production are the same, and the factor with the biggest impact among them (after yeast strain) is fermentation temperature. However, how to you favor one molecule over another when the “volume knob” is the same for both? Let me use an analogy to explain. Let’s say you had a stereo and you labelled the two speakers 4VG and iso-amyl acetate. Let’s further say that, as very quiet levels, the 4VG speaker was slightly louder than the other. However, for every “tick” you turned the volume knob up, the 4VG speaker got louder by 2 dB and the iso-amyl acetate speaker got louder by 3 dB. As you turned the stereo up, the iso-amyl acetate speaker would gradually drown out the 4VG speaker even though both were getting louder. And that, by analogy, is how your fermentation temperature works to control the balance of clove to banana. If you want a banana dominated beer, strive to stimulate ester production. This will mask the 4VG in your beer. Your most effective controller of this — beyond the yeast strain selection — is a higher fermentation temperature. If you want a clove-dominated beer, strive to keep ester production in check, which will allow the 4VG to come through. Lower fermentation temperatures and secondarily higher pitching rates are what you want in that case. The exact temperatures at which banana starts to exceed clove depend on your yeast strain and pitching rate — and given all the variables is something you would need to fine-tune in your brewery. In the final two posts of this series, I’ll cover yeast strains and packaging. I don’t find that the higher fermentation temps (>66F) produce very good or clean beers. Eric Warner is about as well informed as anyone about the production and process of German wheat beers, and his recommendation isn’t to be taken lightly. At the higher temps, I found that the sulfur production is worse, the off flavors and bizarre esters creeping in. Yes you get marginally more banana, but also more funky strawberry and weirdness. As far as top cropping, it’s variety dependent, but pretty much all the hefeweizen strains can be top cropped. I have tried 3068 from Wyeast and WLP380. The scare about the bucket being in a clean room is a bit excessive. Don’t shake a rug over the thing or shake out dandruff hair in it. But it needn’t be an operating room suite level of clean. I like buckets vs carboys for the easy of top cropping yeast. It’s vastly superior, cleaner, and easier than the standard yeast washing and fuss. It’s also much more vibrant yeast. It’s nice to start with a standard hefeweizen, then do a dunkleweizen, then a weizenbock with top cropped and repitched yeast. Because they’re fast maturing beers, it’s easy to bang about 3 beers in about 30 days. Grain to glass in 20 days per beer is pretty easy. You can top crop starting at about day two, and crop each day until fermentation is done. Wyeast recommends waiting until 50% attenuation is achieved, which takes about 24-36 hours depending. I agree that Eric Warner’s recommendation shouldn’t be taken lightly. [That’s why I mentioned it 😎 ] He got his beer education in Germany and is very knowledgeable. I recently had a Kölsch-style beer from his brewery in Houston (Karbach) and it was very good. I think it’s always important to stress cleanliness and sanitation in brewing. And, although you don’t need a clean room (in the sense of a dust-free, sterilized place under positive pressure) to do an open fermentation, I think it’s prudent to do this in a(n everyday) clean room. A great article Chris and I wish you the best on a great journal! This is one of my favorite styles to drink and brew and you’ve summed it up remarkably well. I especially like your analogy on dialing up or down on the clove and banana esters. Keep up the good work and we’ll keep reading and listening. Cheers! Glad you enjoyed the articles! Thanks for the tips. I am now ready to brew an all grain HefeWeizen !